The most cringe-worthy moments from Trump’s first international trip. President Donald Trump shakes hands with French President Emmanuel Macron at the start of the NATO summit in Brussels, Belgium on May 25, 2017. But before we get back to Washington, let’s look at some of the most memorable and embarrassing moments from the trip, in chronological order. The trip seems to have had two distinct phases with Trump seen as pretty successful in the first leg of the journey that included Israel and Saudi Arabia. Things got awkward right from the start though when Trump received a reception fit for a king in Saudi Arabia that included some stilted dancing with swords in tow. Trump had repeatedly criticized his predecessor for bowing to foreign leaders. Yet when he was presented with a gold medal by the Saudi king, Trump also appeared to bow. What’s more, his awkward body movement was so strange that when he came back up many thought they saw the president doing a curtsy. When Trump landed in Israel, footage of his arrival in Tel Aviv on Monday appeared to show First Lady Melania Trump slapping her husband’s hand away. Later, when the pair arrived in Rome, there also seemed to be a purposeful hand-holding dodge but it was less clear so it didn’t get the same amount of attention. When Trump sat down with new French leader Emmanuel Macron the two shared a handshake that seemed to last a little too long. It appears Macron was prepared for Trump’s weird handshake where he tries to show power by jerking the person he is greeting back and forth. So Macron held on and the two shook hands “with considerable intensity, their knuckles turning white and their jaws clenching and faces tightening,” according to a pool report. Trump grimaced, Macron seemed proud of himself. 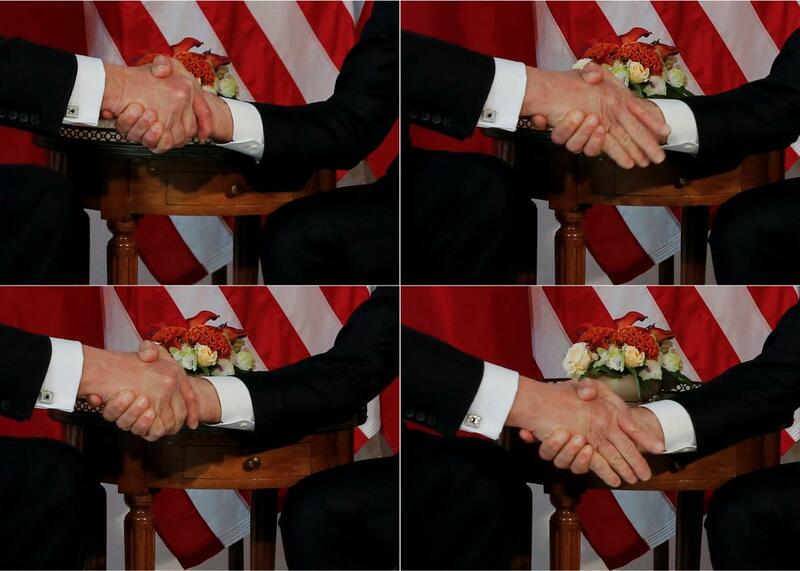 A combination photo shows President Donald Trump (L) trying twice to let go of a handshake with France’s President Emmanuel Macron (R) as Macron holds tight in Brussels, Belgium on May 25, 2017. 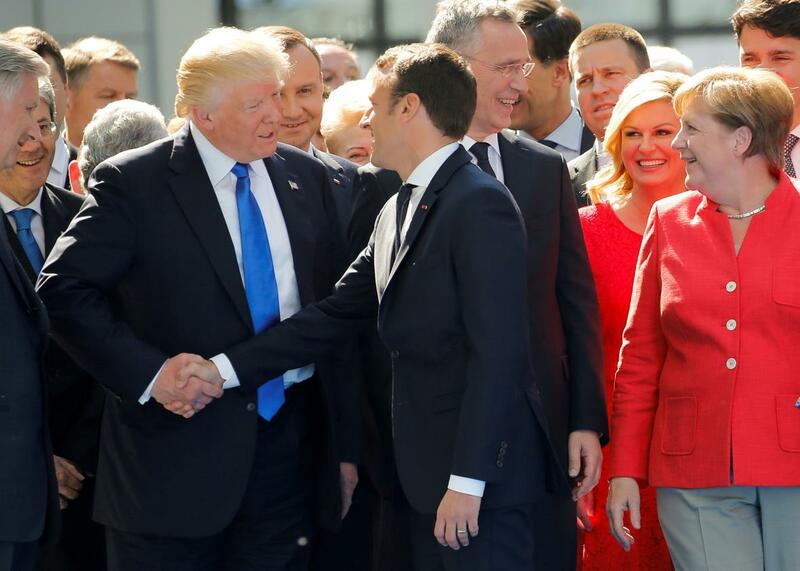 Later, Macron posted a video on Twitter that showed him walking up to a group of NATO leaders and he seemed to be headed straight for Trump. But at the last minute, Macron swerved to warmly greet German Chancellor Angela Merkel. Macron then greets other leaders before shaking Trump’s hand. And this time, Trump was the one who was ready and began moving his and Macron’s hands violently back and forth and up and down. Macron’s victory in the handshake battles didn’t last long.